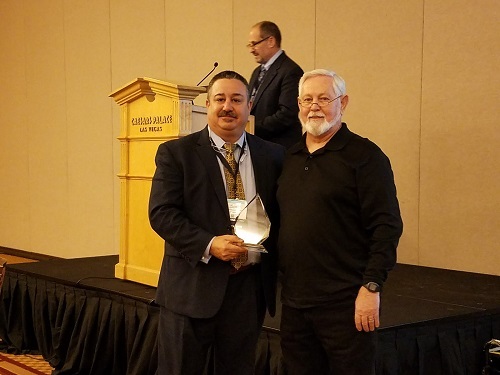 ATLANTA – Recipients of the Indoor Air Quality Association’s Hall of Fame and Advocate of the Year Awards were recognized at the organization’s recent 20th Annual Meeting held in Las Vegas, Nev. The Hall of Fame recognizes individuals who have contributed to the advancement of the science and public recognition of the subject of indoor air quality. IAQA inducted Charlie Wiles and Peter Frasca, Ph.D., into the Hall of Fame. Wiles is the founder and executive director of the American Council for Accredited Certification (ACAC), Yarnell, Arizona. Since its creation in 1992, ACAC has awarded more than 10,000 credentials to IAQ industry professionals. Wiles is past president of the Council for Engineering and Scientific Specialty Board and the Arizona Association of Energy Engineers. As a degreed engineer with more than 45 years’ experience specific to the indoor air quality industry, he has taught certification courses attended by more than 4,000 individuals. Frasca is president and founder of EMSL Analytical Inc., Cinnaminson, New Jersey. Frasca came into the asbestos testing industry from a research background with 28 refereed publications in “human calcified tissues” during his role as Research Associate Professor and Director of Orthopaedic Research at Jefferson Medical College in Philadelphia, PA. He is pioneer in the development and introduction into the industry of several asbestos testing methods for bulk and air samples (2 refereed publications) superior in accuracy to light microscopy methods by employing Scanning Electron Microscope (SEM) and Transmission Electron Microscopy (TEM). Frasca is known for his laboratory experimentation in 1983 of TEM air sample analysis with turnaround time of 24 hours and less (3 hours), replacing the old standard of a 2 week turnaround; thus making feasible the time sensitive clearance of asbestos abated buildings. This rapid TEM turnaround is now industry standard. 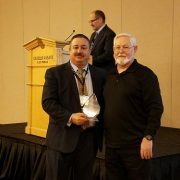 In addition, IAQA Vice President Cole Stanton was honored as IAQA’s first Advocate of the Year. The newly created Advocate of the Year Award recognizes public servants or policymakers who have championed development of law, policy and/or protocols in the area of indoor air quality. The Indoor Air Quality Association (IAQA) is a nonprofit organization dedicated to bringing practitioners together to prevent and solve indoor environmental problems for the benefit of customers and the public. IAQA was established in 1995 and is the nation’s largest indoor air quality trade association with over 2,000 members and some 20 local chapters. More information is available at www.iaqa.org/news.